The opening scene of a James Bond film has to be dramatic and it has to be original. Not all are, but this one most certainly is. Surfers! Yes, surfers. Well, North Korea isn’t the easiest country to get into so this is 007’s best option. And get this, the spy’s surfing skills are World Championship quality. Remove the bottom of the surf board and you have world of gadgetry. There are explosive materials, a communicator, a knife and a gun. It has to be said, it’s a very sensible hiding place. Oh, hang on - the knife isn’t just a knife. Bond plunges it into the ground and the hilt reveals a satellite GPS Scanner. It even rotates to find the best signal. The testing must be extremely rigorous, you just know that had you bought it, at least something wouldn’t work. Gustav Graves has a really fast car that he appears to be using to prepare for an attempt on the land speed record, or at the very least, feed his lust for danger. In an escape attempt, 007 jumps in to get away. The vehicle plunges over a cliff, and this is where, unlike the invisible car, you can enjoy a lack of realism. Gadgets are one thing, devices are another. 007 tears off the panel from behind the cockpit. Handily there are a couple of foot sized rope ties inside. He attaches the parachute and hey presto, improvised Kite Surfing equipment. We do get to see some dodgy, early days CGI, but it is nevertheless a very good spur of the moment escape device. It was a British sea captain and his crew of the Dolphin that were first recorded as sighting surfing, in the Polynesian island of Tahiti in 1767. Captain James Cook's journals also record the pastime during the period. And when Mark Twain visited Hawaii in 1866, he wrote, "In one place we came upon a large company of naked natives, of both sexes and all ages, amusing themselves with the national pastime of surf-bathing." In 1903, Samuel Cody, an Iowan aviation pioneer, developed what was described as a 'Man Lifting Kite' for a crossing of the English Channel. The craft was a small, collapsible boat that took him across the 21 miles. In many respects, this was the sort of indomitable spirit that was a characteristic of many people of that period, and indeed, of the character of James Bond. 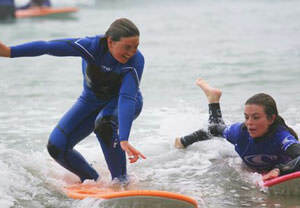 It would be the development of equipment and kit material that saw the introduction of kite traction and surfing. And in 1977 a Dutchman, Gijsbertus Adrianus Panhuise, invented Kite Surfing. Less than thirty years later it is one of the fastest growing water sports worldwide. Both pastimes are now international sports with World Championships and superstar participants. 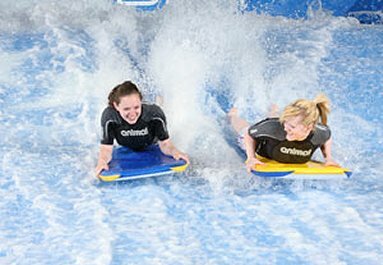 For fans of water sports, or pondering holiday-makers, yearning to 'have a go', there are a few experience companies in the UK who provide you with a chance to do just that. We have provided the most well respected below with example prices - you can click on the icons which will open additional windows to allow you to compare their offers.